TIP: There is no end to the combination of herbs and spices that you can use for these. Try adding oregano or basil, a dash of cayenne, or even finely grated Parmesan or Asiago cheese (add the cheese during the last 15 to 20 minutes in the oven). In large bowl, combine first six ingredients. Set aside. Using a serrated knife, remove the crusts from your bread if desired and slice into ½ inch cubes. Add the bread cubes to the oil mixture and toss until well coated. Spread onto a cookie sheet and bake in the oven, stirring every 10 to 15 minutes, until browned and nicely toasted. The time this takes will vary depending on the amount of moisture in the bread and the size of your croutons. Ours usually take 30 to 45 minutes. Cool on paper towel and store in an airtight container in the refrigerator for up to three days. 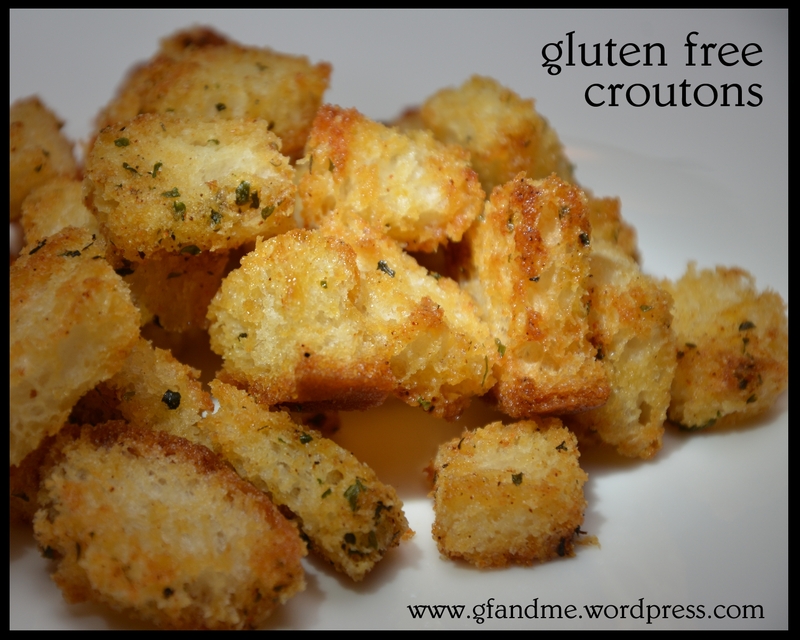 This entry was posted in Baking, Lunch and Dinner, Recipes and tagged celiac, coeliac, garlic croutons, GF, gluten free, gluten free crackers, gluten free croutons, gluten free in Red Deer, recipe. Bookmark the permalink. This is great – will maximize my next salad! Thanks Laura! They were great in our salad last night. mmmm so yummy! I will definitely try this with that cauliflower soup you mentioned! So perfect! Will have to try. Thanks for posting and look forward to following you. Thanks for the kind words. Hope you enjoy the croutons as much as we do. I wonder how these would be in French onion soup? I think I shall put e ingredients on my next grocery list and try! Thanks! I think they would be great. Let me know. Hmmm, french onion soup… sounds wonderful. I’ll have to try these soon on a salad! Thanks for the recipe! Thanks for the tip! Sounds great. gfandme, I’ve never made croutons before. I should be able to use any of the bread I’ve been making for these right? I’ve been experimenting so much I’ve got a little stash of various left over bread accumulating in the freezer. Croutons would be a good way to use some of it. Yes, I would think anything would work. And you can play with the seasonings too. Enjoy.